O’Reilly’s recent SOLID conference, May 21-22 at Fort Mason SF, was all about the intersection of hardware and software, but it also extended and challenged our ideas about what was hardware in a world of new and nano materials, and how software and code becomes tangible. And of course there were robots. 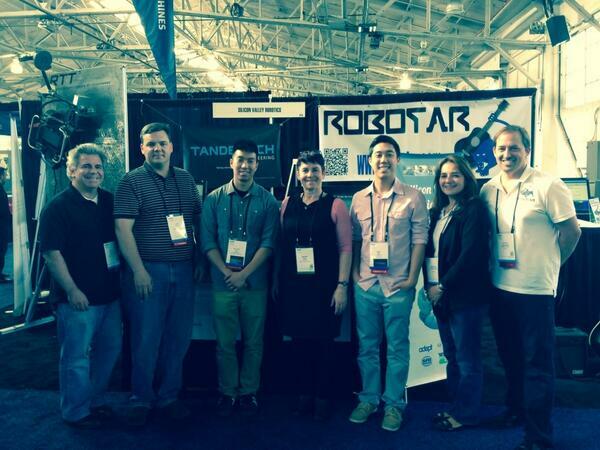 Silicon Valley Robotics had an expo booth showcasing three of the top startups from our Robot Launch 2014 global startup competition for robotics, and I gave a short keynote “Are robots the new black?“. There were robots everywhere, so trying to recap risks missing many. For starters, there was the SOLID hardware startup showcase (Modbots, Modular Science) as well as the Silicon Valley Robotics startup competition (Robotics Technologies of Tennessee, RoboTar and Tandemech Engineering). Plus exhibitors like Bot&Dolly, Otherlabs, Tempo Automation, Rethink Robotics, Boston Dynamics. But a lot of the interesting stuff at SOLID is about the whole hardware process, how the internet is democratizing the supply chain and digital manufacturing in so many ways, which has network effects for robotics as all the various component and sensor technologies get cheaper and cheaper, with smaller batches that are more customizable. All of the keynotes are online and well worth watching but I found these ones particularly relevant for startups – or anyone who wants to understand why hardware is hard and where it has become easier. “Hardware by the Numbers” was a presentation by Renee Di Resta, who is a principal at OATV, O’Reilly Alpha Tech Ventures. OATV is a seed stage investment firm with a portfolio that includes some very nice hardware and robotics companies like: 3D Robotics, Chumby, Misfit Wearables, Littlebits, and Planet Labs. Di Resta gives an overview of the ecosystem for hardware startups and the trends contributing to growth in certain directions. For example, the rise of hackerspaces means that being an inventor is a much less lonely life. And that in turn facilitates information sharing, which speeds up the entrepreneurship process. Di Resta provides data on the manufacturing process, which show that more than 50% of US-based startups are choosing not to go to China. And that 37% of established companies with sales over $1 billion are also choosing to either ‘reshore’ to the US, or ‘nearshore’, as manufacturing in Mexico is called. One reason for this is the rise of wage costs in China. Another factor making reshoring plausible is ‘botsourcing’, the availability of industrial robots for manufacture. Germany, Japan and South Korea lead the way with between 27 and 39 robots per 100,000 workers, whereas China has only around 2 robots per 100,000 workers. And the US is in the middle with about 14 robots per 100,000 workers. And if you like more data, Di Resta has figures on the overall funding levels for robotics and similar hardware categories. 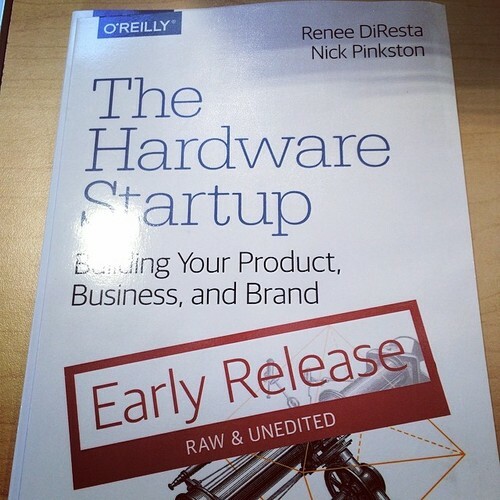 Plus Di Resta and Nick Pinkston have just released the definitive guide to building a hardware startup. If you wanted a deeper dive into the process of manufacturing for startups, Scott Miller from Dragon Innovation gave an excellent talk, and while it isn’t yet online, the slide deck for “How to prevent crowdfunding from destroying the hardware revolution” is. Since 2009, Dragon Innovation has helped more than 100 companies scale, eg; Pebble, Scout, Makerbot, Dash Robotics, Romotive, Leap, Thalmic Labs, Orbotix. At iRobot, Miller was responsible for leading the Roomba technical team. He lived in China for four years as the VP of Asia Pacific, setting up teams in the Pearl River Delta and India and leading the production of 3 million Roomba units. Leaving iRobot after 10 years, Miller saw the difficulty that many entrepreneurs were facing in going from a functional prototype to high volume production. Miller teamed up with Herman Pang, previously of Hasbro, to start Dragon Innovation. And if you ever wondered why Google bought Bot & Dolly in their recent robotics sweep, Tobias Kinnebrew explains how robotics tools and software need to be rewritten for artists – or indeed for anyone – to enable the broad spread of technology. At the moment robotics is governed by tools for experts, and this means we are yet to see the full innovation potential of robotics. Kinnebrew also makes the good point that combining artists and engineers is not a frictionless process, but that this friction is where the creative sparks are generated.